NASA has revealed hard evidence supporting life on Mars today, less than a week after the launch of the European Space Agency’s Mars Express. 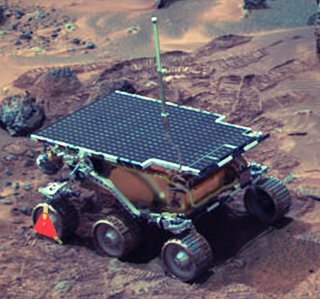 The Mars Express was carrying the Beagle 2 which many believed would beat the American’s in being the first to find concrete evidence that life does, or once did, exist on the red planet. However, photographs from the Hubble telescope released today showed the Sojourner probe from the Pathfinder mission of 1997 to have been immobilised after a wheel clamp was placed on its front left wheel. After spending 5-6 years in a Martian 'no parking zone' the local authorities decided it was time to clamp the American vehicle. NASA believes that following its 6-year period of inactivity the vehicle must have exceeded the time limit for parking for the zone it stopped in. When asked if they intended to pay the fine to have the clamp removed they stated that they believed that the vehicle should have had ambassadorial status making it exempt from such offences. In a press conference held at the White House, George Bush revealed that the rockets due to take off on Sunday would now have their missions altered - in light of the new evidence proving life to exist on Mars. The Delta 2 rockets were intended to carry two larger Martian Rovers, based on the design of the clamped Sojourner probe, with the intention of looking for evidence of life. As life had now been discovered the first rocket would contain a rover, although this Rover’s purpose would be to plant an American Flag on arrival, and then initiate a regime change if the Martian’s refused to unclamp the vehicle. The cargo space on the second rocket was purchased by Fox, who on hearing there was a spare rocket to Mars due to be launched quickly contacted Donald Rumsfeld who put in a good word with the President and secured them a deal. Fox intends to launch a Reality TV Show based on “I’m a Celebrity get me Out of Here.” where older celebrities trying to regain their fame take part. However, instead of the final celebrity remaining being declared the winner, they will be placed in the Delta 2 rocket and blasted to Mars. So far, no celebrities have been approached for taking part – however, on hearing about the competition being held in America, Victoria Beckham did enquire to see if she could participate. Despite her enthusiasm, her request was declined, as the producer has no idea who she was.